Where’s the Diversity in Literature? I read a lot. And in all that reading it’s apparent that diversity is lacking. I like to tell myself that’s because of my own tastes or my own white privilege. Those official statistics on diversity in children’s literature are getting better, but not much. They also include stats about the authors, and as you might guess, there are even fewer authors of color than characters of color. These questions matter because we find ourselves in books. Christopher Myers calls them maps to who we are. Books are an atlas to the world, helping us find our place, but also telling us where we can go and who we can be. And if you don’t see yourself in the books you read, that can be rather bleak. I want it for my son, who is black, and will suffer from not seeing people who look like him. I want it for all the kids out there who don’t see themselves represented in their favorite stories. I want it for myself, because I am sheltered and privileged and need to see and grasp a wider view than my own. I want it for the world, because I’ve seen the healing power of understanding that comes when we listen to those who are different from us. And too often in our history has difference been reason enough to shed blood, whether it’s native massacres, the Boxer Rebellion, the Holocaust, the Rwandan genocide—all complicated issues for sure, but all at least partially rooted in difference. As I watch news stories today about people hating those who are different from them, I honestly and idealistically believe diversity can help us overcome such hatred. Remember that diversity is about so much more than race. It’s gender and class and age and religion and location and more. When I threw that stat out to social media earlier this month, a friend commented that I should do something about it. And I was inspired. I don’t know what I’m going to do, but I’m going to do something. I don’t write a lot of fiction, and I’m hesitant to write a story about a character of color just for the sake of diversity. That tends to end badly. But as I pursue creative projects, it’s on my mind. That’s me as a creator. As a reader, as a consumer, we can embrace diversity in what we read. That might require searching it out. You might have to hunt for it. But find those books, buy the ones you love, recommend them and share them. I wish we didn’t have to work so hard to find diversity, but we do. Sometimes we have to work hard to correct a wrong, over-steer until things find a balance. It’s hard. You want to find a good book, and you don’t so much care who wrote it. The color of the main character shouldn’t matter. But if, like me, you scan your shelf or your reading list and see lots of characters who look just like you written by authors who look just like you, then the balance is off. And maybe you don’t know the race of the authors you read. It’s a fine excuse. But go through Goodreads and look at author photos. See who’s writing the books you read. Going through my list I don’t think there are more than a few of books in the last few years that were written by a person of color that I didn’t intentionally choose for that reason. Diversity rarely happens by chance. It’s a problem that won’t get fixed by itself. You need to seek out diversity. The good news is that there’s no shortage of good books. Search out a few and begin to find some balance. It’s something I’m constantly working at. This is just a start, other folks online could probably give you a much better list. You can start with Walter Dean Myers. Monster is one his critically acclaimed, though I think Darius & Twig is my favorite (it’s about a writer and a runner, so go figure). His son, Christopher Myers, has illustrated several children’s books and I’ll be checking those out. Octavia Butler’s Kindred is one of my top five favorites from last year. Colson Whitehead’s Zone One is another favorite. 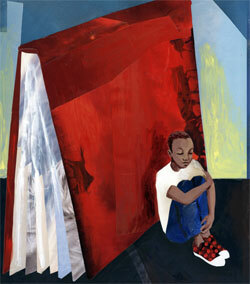 For illustrated books, I admire the work of Andrea Davis Pinkney. Oscar Hijuelos is a Pulitzer Prize winner and writes with a beauty that flows like water. Maya Angelou is another classic author who has a way with words. I just started reading the graphic novels of Gene Luen Yang this week and am really enjoying his style. Some other random choices include The Returned by Jason Mott, The Impeachment of Abraham Lincoln by Stephen Carter, A Long Walk to Water by Linda Sue Park, Beneath the Lion’s Gaze by Maaza Mengiste, Gabriel’s Story by David Anthony Durham and Home of the Brave by Katherine Applegate. And I’m hoping to add more. I’m currently reading Alif the Unseen by G. Willow Wilson and I’ve got works by Jesmyn Ward, Swati Avasthi, Mitali Perkins, Okey Ndibe and others in my to-read stack. Much of this list is adult fiction, because that’s what I read. I’m not as well-versed in kids’ books, though my wife is. A few names come to mind, including Ezra Jack Keats, Donald Crews and Ashley Bryan.